Barceloneta definitely attracts many tourists eager to sunbathe, splash in the sea and make the most of the beach in the center of Barcelona. Last summer I lost count how many people asked me for directions to get to there. The crowds are usually wild and noisy but never hungry or at least not without options to find a place for a meal or a quick bite. There are many seafood restaurants just by the beach and in the summer, lively chiringuitos are also thrown into the mix offering refreshing drinks and tasty snacks. As much as I enjoy the beachside life I recommend exploring the narrow streets and small squares of this charming neigbourhood. 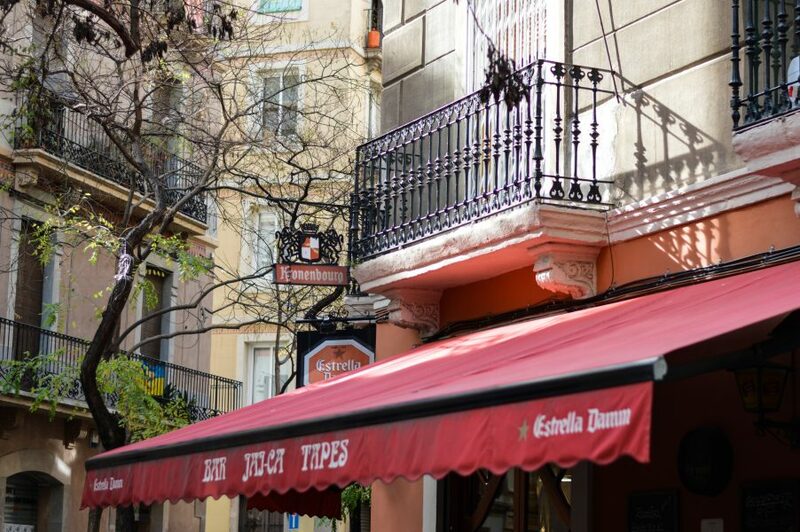 Some restaurants and tapas bars in Barceloneta are my absolute favourites and whenever my friends and family visit me in Barcelona I take them there for lunch or dinner. It is fair to say that this is my number one tapas place in Barcelona. I always sit right at the back of the restaurant as there is a covered terrace available and even in wintertime, although with my jacket on, it is nice to eat out there. From typical tapas options I usually order tortilla de patatas or patatas bravas, an octopus prepared the Galician way and mushroom croquettes. My favourite salad is the one with goat cheese and I often order tuna tartare with creamy avocado and Asian-style dressing. If I still have enough room for desert I order a delicious lemon pie to share. Food at Bitácora is great and prices are reasonable, just be prepared that people working there are not all smiles on every occasion. I do not normally go for tapas when I am at Filferro so this is why Bitacora comes first but this place does not lack tasty food options, style and character. There is a fantastic mix of tapas, sandwiches, salads and main dishes on the menu so anyone can find something suitable. I often ask if there are any special dishes of the day available. I am a big fan of their soups and the Filferro salad with avocado and a sweet honey dressing. I have a small tip for people with children. The outside area of the restaurant is next to a playground with swings so if your kids are full of beans you could use it. If you hang out with adults you might want to check out the Absenta bar across the street. The decor of that place is incredible – just mind that naked lady flying under the ceiling. This place, famous for its tapas, tends to be very busy any time of the day so I have never had a chance to sit inside. On the other hand a table outside works well for me! 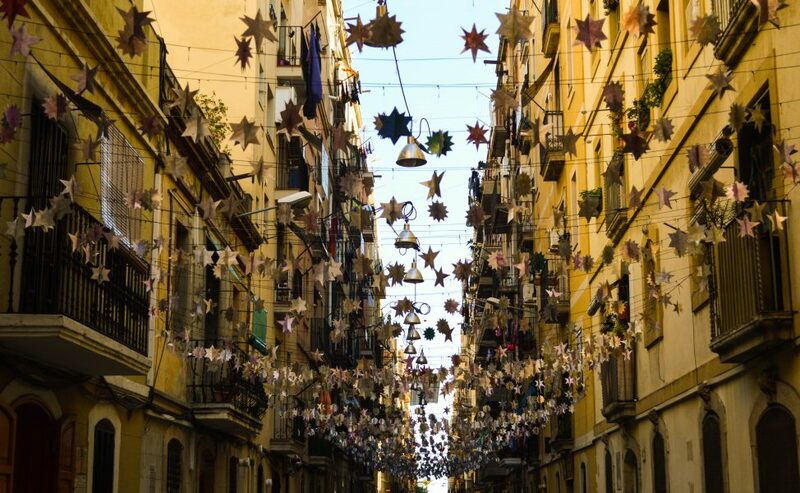 Visiting Jai-ca is certainly an authentic Barceloneta experience. Except the noise and the tapas you also get to look at pictures of Barça players hanging on the wall. When writing about Barceloneta in a context of food I have to mention my favourite bakery. It is local, authentic and I love shopping there. All the products are freshly baked and when you peak through the windows you can see most of the times how they are preparing them. If you are staying in Barceloneta while on holiday in Barcelona, get the bread or croissants for breakfast or a little snack for lunch from this bakery. It is worth it! They are extremely friendly so do not be shy and buy different goodies to try. Throwback Sunday… Can’t wait to be back in the hood, even if only for a couple of days in May! Will pass this entry to my Berliner friends in search of some good tips on visiting places when in Barcelon(et)a.
Haha! Throwback for you indeed. Thanks for sharing! Love this Weronika! When I’m back, I know where I’m going for food :-) thanks for showing me round last week. My pleasure! Come back soon.